My first experience with the Deschutes Brewery was nearly a decade ago. Beerford McBrewin’ (a loyal Alehead reader) and I took a road-trip across this noble nation from my homeland of New England to his, the Pacific Northwest. This was a questionable decision on both of our parts. Beerford is a bit of a sociopath. He once slaughtered a mouse with his own bodily fluids and he’s been known to murder drifters just to get an erection (like Neil Diamond!). Add to that a penchant for ungodly flatulence and notoriously bad taste in music (think Enya, Journey, and a cappela music), and you’ve got a road-trip companion from hell. Sounds like I’m the one that made an egregious error in judgment until you realize something vitally important…that I’m even LESS pleasant to spend time with. Yet, somehow, we got along famously as we discussed our hatred for every other human being in the world and occasionally tried to stab one another with broken glass bottles. When we arrived, broken but unbowed, in Beerford’s native land, we immediately partook of the triumvirate of goodies promised to me when I agreed to make the trip. Namely, dungeness crab, cheap Oregonian whores, and Deschutes beer. The crabs were plentiful (both from the sea and from the whores). And the beer? Absolutely spectacular. Deschutes is, sadly, not a household name…and that’s a crime. The brewery has been cranking out award-winning brews almost as long as Sam Adams (it was founded in 1988), but because it only distributes on the West Coast, it never gets the name recognition it deserves. It also doesn’t put much effort into marketing or PR. While breweries like Sierra Nevada, Stone and Anchor have become synonymous with West Coast brewing thanks to quality products AND great marketing, Deschutes is content to toil in relative obscurity. But for those of us who have sampled their suds, the brewery is in truly rarified air. Simply put, it’s one of the best in the world. The first Deschutes offering I had on that road-trip was their exquisite Obsidian Stout which quickly became one of my all-time favorite stouts (and my go-to brew in bars in Oregon). Their Black Butte Porter is the equal to the Obsidian and their Abyss is recognized as one of the finest beers on Earth (currently sitting at #3 on BeerAdvocate). They also make some brilliant hoppy beers like their Bachelor ESB and Cascade Ale. It’s one of these hoppier offerings that I’ll be looking at today…the Hop Henge Experimental IPA. Beerford and I have begun a beer trade where I’ll send him some of the finer Southeastern offerings in exchange for some classic Pacific Northwestern brews. Sure, it’s a one-sided trade, but he owes me for some of the things that happened on that road trip. I won’t go into detail, but let’s just say that if you see a pile of Basque skeletons near a gas station rest stop in Idaho…well, they were like that when I found them. 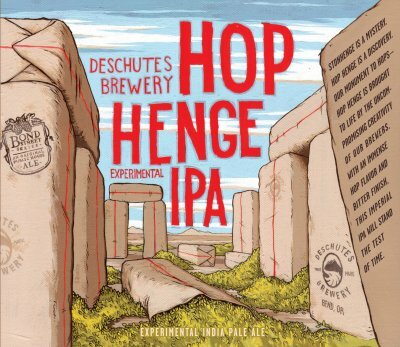 The Hop Henge is part of Deschutes “Bond Street Series” which pays tribute to the brewery’s early days on Bond Street in Bend, OR. It’s an Imperial IPA, but unlike many over-hopped, extreme brews of the style, it’s very delicately balanced and well-crafted. The Hop Henge pours a rich, clear amber with a bright, white, fluffy head that hangs on tight for the ride. Excellent lacing clings high on the glass and sparkles brightly. This is an eye-catching beer. One aspect of Deschutes that I simply love is how responsibly they use hops in their beers. Rather than just bashing you over the head with hops aroma, the nose is refined…almost considerate. And while other Double/Imperial IPAs focus heavily on either pine or grapefruit, the Hop Henge has a pleasant balance of both those aromas. It’s lemon-fresh and floral…citrusy and herbal…refreshing and alluring…and that’s just upon first whiff. After the hop nose subsides, a beautiful caramel-malt profile rises up. A slight tinge of noseburn rounds things out (8.75% ABV on this one). The flavor mimics the nose…with bitter (but not overly so) hops challenging your palate before the sweet, subtle taste of the malt bill hits you in the middle. The finish has a touch of booze, but mostly a lingering citrus taste. It seems (to me anyway) that the more subtle floral hops actually hit you in the beginning and the bigger grapefruit in the finish. The reverse is usually true for a West Coast Imperial IPA (the grapefruit is generally the first thing you notice), but Deschutes does not make “usual” brews. Mouthfeel is silky-smooth…it’s a medium-bodied brew, but drinks lightly thanks to excellent carbonation. Drinkability is very high…a hallmark of Deschutes beers. I thoroughly enjoyed this 3.5 Hops offering. A hearty thank you to Beerford for sending it my way and for introducing me to a brewery that should be on the short list of ale factories that all Aleheads need to know about. Posted in Ale Factories, Tasting Notes.Tagged Deschutes, Double IPA, Hop Henge, Imperial IPA. I can second the love for Deschutes. The first time I went out to Portland to meet my wife’s family we went to the Deschutes brewery in town and I had the Black Butte Porter. Spectacular! My trip out west this summer will hopefully be colored by many Deschutes beers… It’s a shame that the big brewery is so far away in Bend. Deschutes is a household name out here. It’s ubiquitous…Mirror Pond is a standard, but they make dozens of delcious brews. Hope Henge was my session beer for two weeks until we ran through it at the local pub (it was on tap from approximately early to mid-May). I completely agree with a very high drinkability…bring Hope henge back!